Hubby and I took a trip up to New York City back in early January of 2012 and spent 3 days and 2 nights at the Element by Westin hotel near New York Times Square. This is a modern day eco-friendly hotel that is very clean, modern and the hotel staff is super friendly! If you are looking for accommodations near Times Square...we highly recommend the Element! While in New York City we had dinner during our last night in the city at Patsy's Italian Restaurant which is located at 236 West 56th Street in New York City. This is a family-owned restaurant that has been in business since 1944 and is a frequent "hot spot" of many high-profile celebrities. If you want to dine there you will indeed need reservations! The night that we dined there my husband had a nice thick & juicy steak and I had a delicious Italian pasta soup with a salad. The food was absolutely delicious and the staff was fantastic! We didn't have to wait long to get served and we were in and out in less than 90 minutes flat! 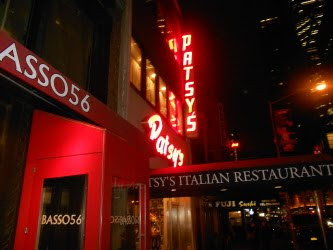 The next time we visit New York City we will definitely be dining at Patsy's Italian Restaurant again and we highly recommend you dine there too! Enjoy...the menu is fantastic!